My home jersey number was 12. I’m sitting on the wooden floor of a gym right now, listening to the distinctive percussion and squeaks of a basketball practice. The practicees in question are between 6 – 8 years of age. For many of them, it’s their first time with a basketball. Others can, with calm collection, make actual baskets on full height hoops. This is the tenth and final session – I’ve signed Msr. Grey up for another basketball session at the Y next session. But already I think he’s better than I was in Jr. High. He can dribble (kind of), pass (kind of) and shoot (kind of). He doesn’t know the rules of the game, but that will come. 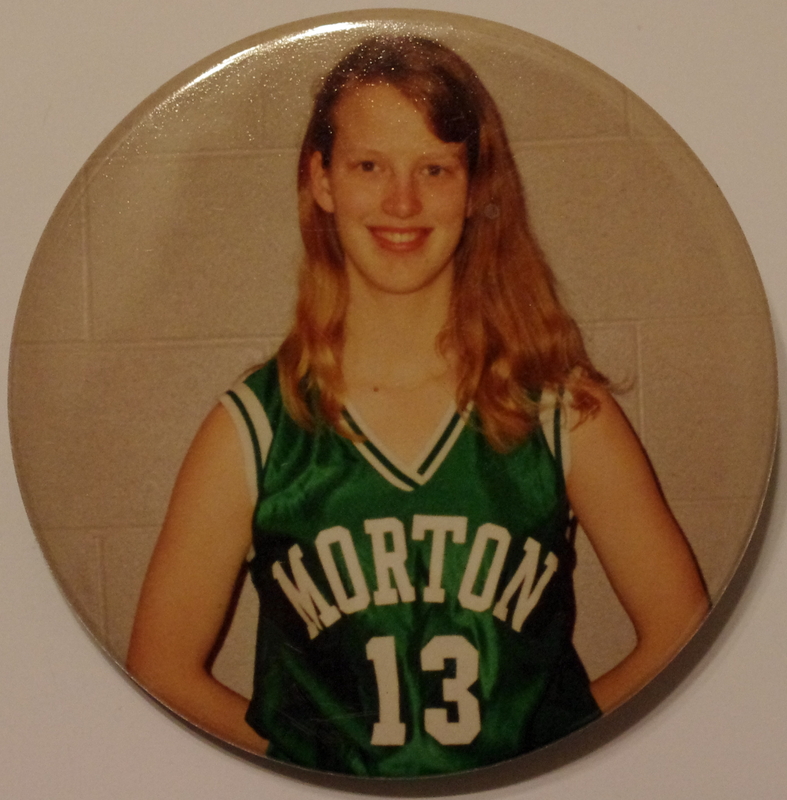 Depending on why, how and when you know me, it may come as a vast surprise to you that I played basketball. In fact, not only did I play basketball, I played at the State level. (A Very Big Deal, in case you’re from a more urban or non-American childhood.) I started Jr. High as a three sport “athlete”. I played volleyball, basketball and track – in addition to my rather extensive musical activities. With volleyball, I only lasted through jr high, although I was a line judge through high school – respected enough they brought me along when they went to state. With track, I ran the mile, the 100 meter high hurdles, the long jump, the triple jump and the relay. I was terrible at the running, and middle of the pack at the jumping. I lasted to sophomore year of high school. I was part of a state relay team, and was part of the handoff that dropped the baton. I took full responsibility. But I lasted longest in basketball, and liked it best. Lest my litany of athletic accomplishment make you think you have misjudged me, I promise you haven’t. I was a TERRIBLE athlete. None of it came naturally. I had no prior exposure to sports. I didn’t know even the most basic rules of sports games. Things that were part of the culture and nature of my peers had passed me by. I recall in a certain little league game, I skipped third base on a good hit because it seemed more efficient to run straight home. And although I was healthy and somewhat active, I was not at all athletic. I still am not at all athletic. But I think athletics taught me some of the most important lessons I learned in high school. First, it taught me how to be terrible at something I tried hard to do. I mostly did things that came easily to me. Academics were never my problem. Like most people I focused on things I was good at and convinced myself that things I was bad at were less important and less valuable. I think it’s very easy to put your head down, focus on your areas of competence and ignore your areas of weakness. It helped that a certain segment of society agreed that academics were more important than sports. But because my school was so very small (There were fewer than 120 kids in the high school. My graduating class was HUGE with 42. Two years prior, we’d graduated 28. ), and so very athletic, there was somehow enough peer pressure or something to convince me to attempt to challenge my weakness, and study an area in which I was not interested. But with basketball, I was terrible. I had no natural advantages and several significant disadvantages. I couldn’t shoot, had ball handling skills worse than several of these kids I’m watching now, got tired running and generally struggled. But I practiced, and practiced. I played with the boys at lunch (to their vast chagrin). I ran the lines hard. I tried to force my uncompliant body shoot from the knees, follow-through, know the ball. I got playing time because the school was so small that everyone got playing time. I progressed from the worse player on the team to only the second worst player on the team. Despite my massive incompetence, there was a lot of pressure to sign up for the the team because – truly – we were on the edge of not having enough players to HAVE a JV team. My coaches went from annoyed to bemused to fondly affectionate as the years clocked by. Over six long years, I became a part of the team. In my final basketball memory, we were in Spokane at State (where the Morton/White Pass girl’s and boy’s basketball teams are right now, as a matter of fact). It was our third game. After having won the first two, we were against a local team and I don’t mind admitting that the refs were horribly biased. It would have been a tight game anyway – they were good – but after our top scorers* fouled out we had no chance. You are allowed to bring 12 girls to the game. Our team only had 11. So I was there – at the bottom of the bench – living and dying with every pass up and down the court. My grandfather and dad were there – my grandfather actually put my paralyzed grandmother into respite care for a weekend so he could be there, for me, at the state tournament. And Mr. Henderson and Mr. Coleman – losing one of the biggest games they’d coached – grinned and looked at me and told me to get on the court. There were 1:47 seconds left, and in that time they ran all the plays around getting me a shot. I missed one and committed a foul and am IN THE BOOKS at the state tournament. I had earned (and been given) a place where I was not gifted, capable, advanced or impressive. I had conquered my weakness, ignorance and inability with great effort in order to accomplish medoicrity. I would never be GOOD. But I was there, and it was good for me indeed. It may be that I am taking that experience of being terrible away from my son with these early lessons. He’ll never feel quite as out of water as I did, and in his image of himself, he is athletic. But I can’t say enough about the importance of trying really hard to do things you’re terrible at – so that you can understand what can be accomplished by hard work, and what you were given as a gift. I had spent years feeling smug in classrooms as the kids next to me struggled with things that came easily to me. I needed the gift of humility that came with then going to practice and struggling with things that came easily to them. *One of the very best – well top three – of the basketball players on that team was Brandy Clark. I remember her primarily as an astonishingly good 3 point shooter. She could get 7 of 10 from the three point line, even under pressure. She was an awesome weapon – with a thick ponytail and a big smile. I didn’t even know that she PLAYED guitar. To me, she was primarily a great athlete and nice person. Her song Better Dig Two just won a Country Music Award and is topping the Country Music Charts. Another of the great players on that team – Sarah – was an astonishingly gifted all around player. She was fast, tall, had amazing hands, and could really shoot. I’ve since seen pictures of her on Facebook with another Morton Grad… at the White House Christmas party standing next to Michelle Obama. I remember Sarah thanking me, my senior year, for helping her see “brainiacs” in a more sympathetic light. She told me she respected me. It meant a lot. I sometimes ponder how incredible and lucky it is that I have spent so much of my life surrounded by such incredible people, even if we didn’t know it that winter in Spokane when we were 15.